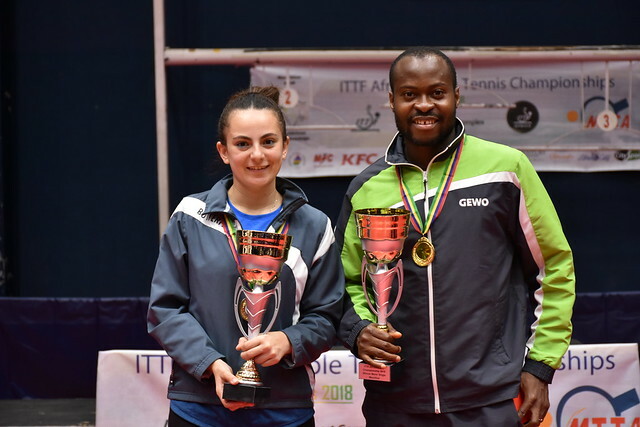 A first round defeat earlier in the year at the ITTF Challenge Seamaster Nigeria Open in Lagos; resigned to the bench as he watched his colleagues secure gold in the Men’s Team event on the third day of action at the 2018 ITTF-African Championships in Port Louis, Mauritius; on the penultimate day, Saturday 8th September, Nigeria’s Olajide Omotayo was a young man in form. He emerged the player to cause the biggest upset in the third round of the Men’s Singles event. The 23 year old accounted for Egypt’s Mohamed El-Beiali, the no.3 seed (9-11, 11-9, 11-8, 11-9). Success for Olajide Omotayo; there was also success for his colleagues Quadri Aruna, Segun Toriola and Bode Abiodun. Quadri Aruna, the favourite for the title, beat Benin’s Monday Olabiyi (11-4, 11-6, 11-9, 11-1); Segun Toriola accounted for Madagascar’s Stephen Ravonsin (12-10, 11-7, 11-3, 11-8), having one round earlier been stretched to six games by Egypt’s Youssef Abdel-Aziz (11-9, 11-7, 6-11, 11-7, 9-11, 11-9). Similarly, Bode Abiodun reserved his last eight place courtesy of success in opposition to South Africa’s Theo Cogill (11-7, 11-5, 12-10, 11-3). Disappointment for Egypt; however, there were notable third round Men’s Singles successes. Ahmed Ali Saleh beat Algeria’s Larbi Bouriah (11-4, 11-5, 11-7, 11-8), Khalid Assar accounted for Togo’s Koki Dodju Fanny (11-4, 5-11, 11-5, 11-5, 12-10). Likewise, Shady Magdy and Aly Ghallab enjoyed wins. Both ended South African hopes. Shady Magdy overcame Shane Overmeyer (11-6, 11-3, 8-11, 10-12, 11-9, 11-8), Aly Ghallab ended the adventures of Terrence Mathole (11-9, 11-7, 11-4, 11-8). At the quarter-final stage, Quadri Aruna meets Khalid Assar, Shady Magdy opposes Olajide Omotayo; in the lower half of the draw it is Segun Toriola versus Aly Ghallab, Bode Abiodun in opposition to Ahmed Ali Saleh.